Skyscrapers are impressive, sure. Tunnels are cool. Aqueducts? Do they even build those any more? While there's no shortage of amazing structures around the world, when it comes down to it, nothing quite demonstrates engineering prowess like a bridge. And to prove that point -- or to at least show you some insane pictures of crazy-looking bridges -- we rounded up 19 of the most innovative. Nestled above a river gorge in China’s Hubei Province, the Sidu River Bridge was the world’s highest when it opened in 2009. More than 1,500ft in the air, the bridge could fit Shanghai’s Oriental Pearl Tower, the Empire State Building, and the John Hancock Center beneath it. 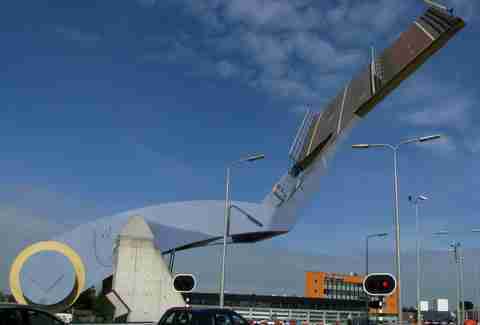 Not to be confused with a set from the movieTransformers, Slauerhoffbrug is an automatic bascule bridge in the city of Leeuwarden, Netherlands. Erected to look more like a catapult, the bridge uses two arms to pick up and move a section of the road in and out of place. 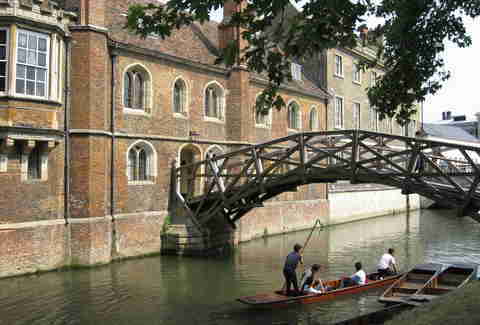 This engineer’s dream connects two areas of Queen’s College over the River Cam. Though its official name is the Wooden Bridge, the structure -- which is an arc made entirely out of straight timbers -- gained its sobriquet thanks to the sophisticated mathematical design used to construct it. 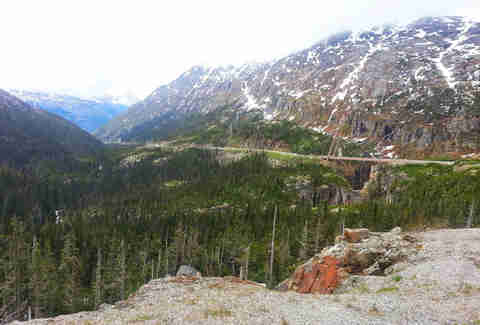 Built 110ft above an active earthquake fault in Alaska's Moore Creek Gorge (along the Klondike Highway in Skagway), the Captain William Moore Bridge was designed with only one anchored end, ensuring the almost 40-year-old crossing isn't torn apart if the ground below shifts. Despite the fact that it actually lies some 230 miles off the coast of Indonesia, Christmas Island belongs to Australia. 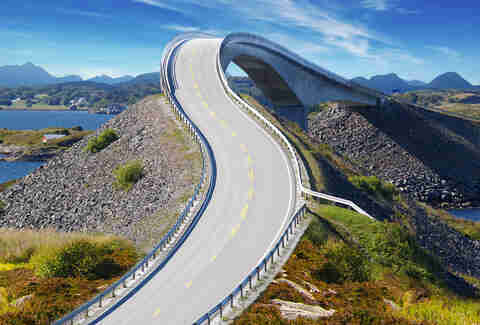 It's also home to some of the world’s more interesting bridges not built for humans. Millions of red crabs inhabit the local forests of CI, and each year they migrate from the island to the ocean. To help the little guys on their forward march, wildlife rangers construct bridges over the island's roads. Sure, it’s become a bit of a tourist trap, but the Royal Gorge Bridge is still a sight to see at 955ft above the Arkansas River in Cañon City, Colorado. 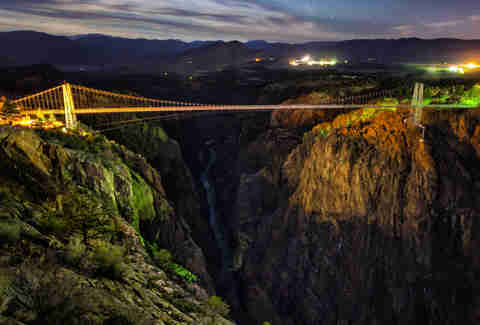 While it no longer holds the record for highest bridge in the world (as it did from 1929 to 2001), RGB remains the highest suspension bridge in the country. If you can wait until spring 2015 to visit, the park plans to open a zip line and a gondola ride. 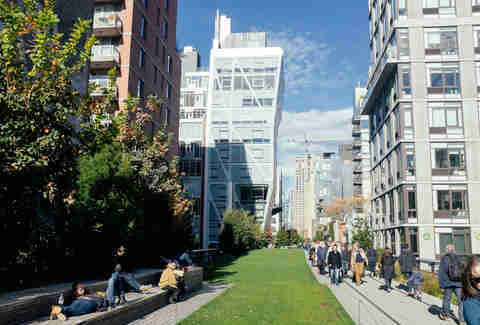 NYC is full of cool bridges but the High Line is an incredible feat of modern urban planning. The near mile-and-a-half elevated walkway/tourist trap along the West Side (formerly a part of the New York Central Railroad) provides a nature refuge for city dwellers looking for a leisurely stroll before sipping cocktails in the Meatpacking District. 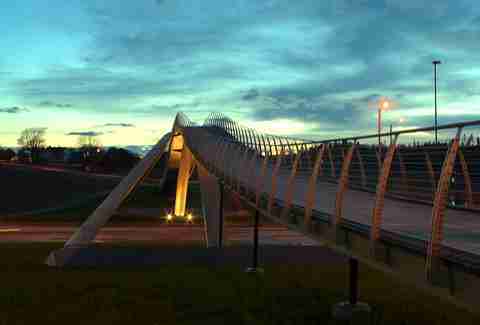 The vision for this bridge lay buried in one of the namesake artist’s notebooks before it was made a reality in 2001. Leonardo Da Vinci initially designed it in 1502 as a bridge to cross the “Golden Horn”, the famed waterway separating western Istanbul. While the sultan might've declined, Norway decided to build a much smaller, wooden version near Oslo. Paris's famous bridge partially collapses under weight of "love locks"
With a little ingenuity, the local War-Khasis tribe in the Indian village of Cherrapunji learned how to tame Ficus tree roots to grow in a certain direction to form bridges that can support the weight of up to 50 people. Technically more grown than built, the bridges can extend 100ft in length but take up to 10 to 15 years to become fully functional. 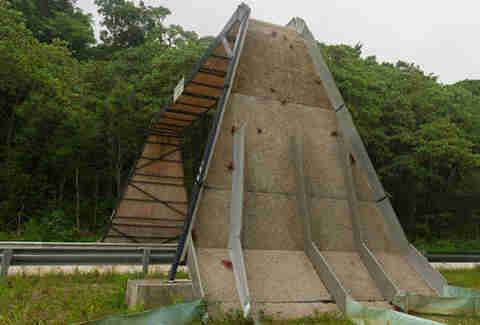 Sorry St. Louis, Brazil gets the trump card on arches. 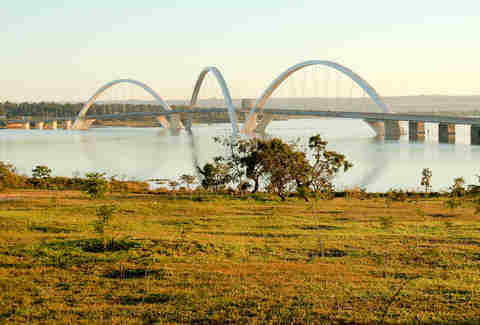 The Juscelino Kubitschek Bridge comprises three sweeping steel arches crisscrossed over a 3,900ft-long deck. The grandiose structure sits above Lake Paranoá in the capital city of Brasília. 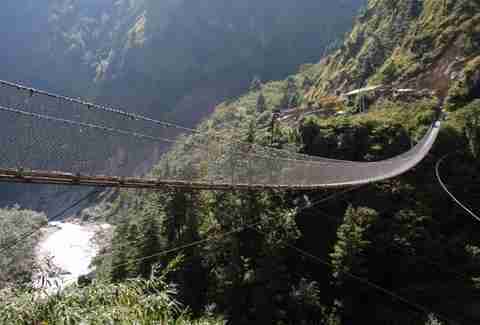 Erected to help ease the congestion caused by herds of cattle plugging up Nepal’s narrow roads, this footbridge high above the Burugdi Khola River is still used daily by local villagers to move animals and deliver produce. 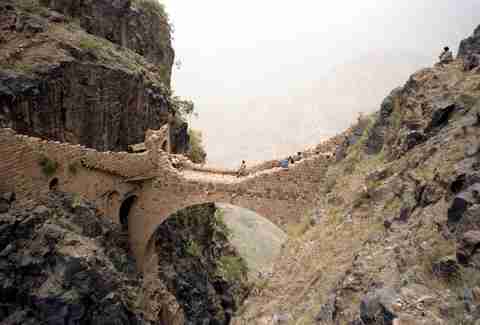 Built to protect Shaharah -- a mountain village perched 8,530ft above sea level -- from potential invaders, the impressive bridge is made entirely of stone and sits atop a massive 300ft canyon. 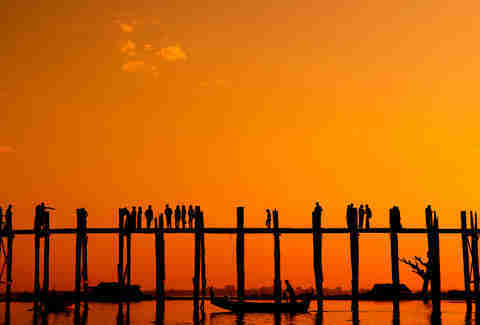 Situated on Taungthaman Lake near the former Burmese capital of Amarapura, U Bein Bridge was constructed in 1857 when the capital city moved to nearby Mandalay. 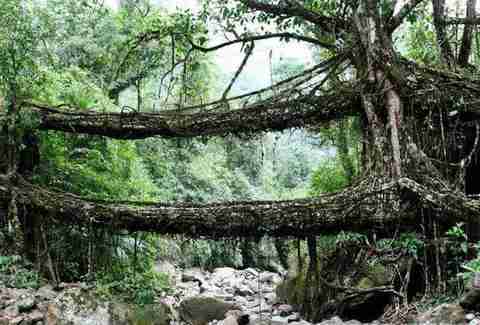 The local mayor, U Bein used unwanted wood salvaged from a teak palace to create the expansive 3,900ft-long crossing. If the above pic is any indication, best to save your Instagram shot for sunset. Giving new meaning to the phrase "raise the roof/road", the Pont Gustave-Flaubert is a vertical-lift bridge situated on the River Seine in Rouen, France. 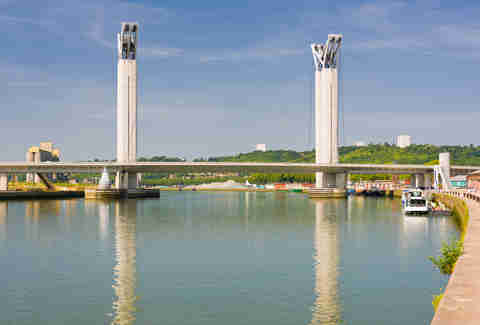 Rather than separating in the middle like a drawbridge, the unique design uses a butterfly pulley system to elevate a section of the structure above passing ships. Touted as the highest lifting bridge in Europe, the platform takes just 12 minutes to go up/down but is only raised about 30 to 40 times a year. 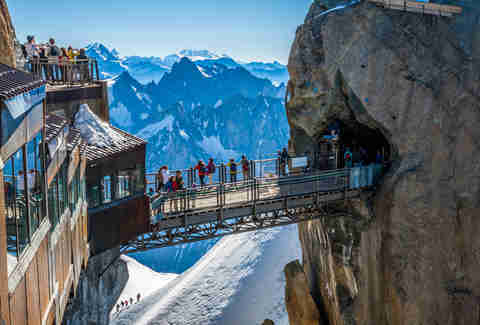 Tucked away in the French Alps, the Aiguille du Midi is a brief but unnerving pathway in the Mont Blanc massif near Chamonix. Suspended more than 12,000ft in the air, the bridge is accessible only after a heart-stopping 20-minute cable car ride up the mountain. Although the bridge is used mostly by pedestrians and bikers, it’s also the notorious jump-off point for the AJ Hackett Bungy Company near Queenstown on New Zealand’s South Island. 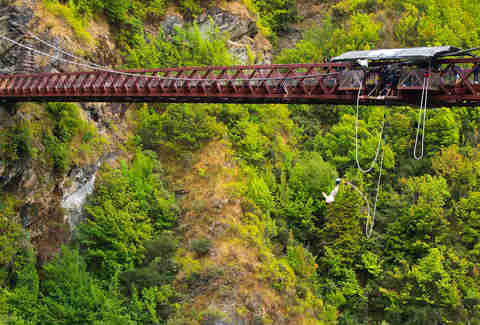 In fact, it was the site of the first commercially operated bungee jumping operation in the world and has helped build Queenstown’s reputation as the capital of, well, safely jumping off bridges. Heed this warning: you may enter another realm upon crossing this bridge. That, or you’ll wake the rockbiter from The Neverending Story. 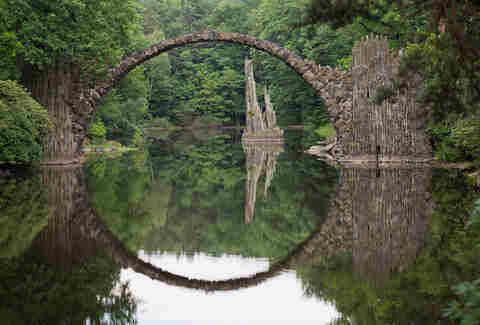 Rakotz Bridge (“Devil’s Bridge”) in Kromlau, Germany, was built to create an optical illusion; regardless of the vantage point, it forms a perfect circle with its reflection in the waters of Lake Rakotzsee. 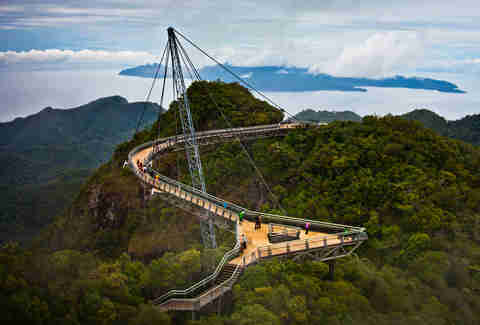 A casual 2,300ft about sea level, the Langkawi Sky Bridge is a winding cable-stayed structure accessible only by foot (and cable car). 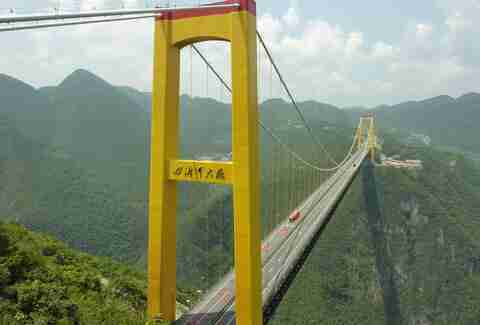 More roller coaster than mode of transport, the bridge provides scenic views high above Mount Mat Cinchang. Unfortunately (or fortunately, depending on how you look at it), it's currently closed for maintenance. Just for fun, pop in your favorite Talking Heads tune, “Road to Nowhere”, and pump the gas when crossing this optical illusion. Although quite safe, the design of Storseisundet Bridge along Norway's west coast conceals the road as drivers approach, making it appear as if their car is about to plunge into the sea. 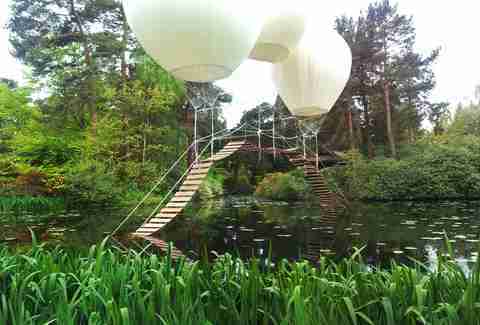 Tatton Park, Knutsford, Cheshire, U.K.